Description: Marjoram is a member of the Origanum genus, and shares both species and similarity of flavor with Oregano (Origanum vulgare). It has a strong and sharp spicy odor Marjoram is a perennial evergreen shrub (treated as an annual under cultivation), growing to a height of about 40 centimeters. It has a square, red-brown stem and small and hairy, gray-green leaves. During summer, the plant produces tiny, white to pink flowers. Useful components: Caffeic and rosmarinic acid, caracrol, flavonoids, linaloool, terpenes triterpenoids, sabinene, sabinene hydrate. Medicinal use: Marjoram is considered to have expectorant, sedative, carminative and stimulant properties. The plant has beneficial results used both internally and externally. Its internal use is helpful in cases of bronchial and chest disturbances, headaches, insomnia, digestive complaints, anxiety and painful menstruation. Used externally, usually in form of an essential oil, it can relieve muscular pain, ease the swollen and stiff joints, and can be of great help in case of arthritis. Oil applied directly to the skin can disperse bruising and help in treatment of chilblains. 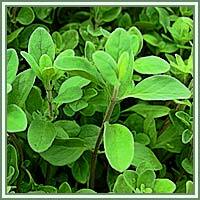 Marjoram can also be taken in cases of excessive gas and bloating. Safety: Essential oil shouldn’t be taken internally. 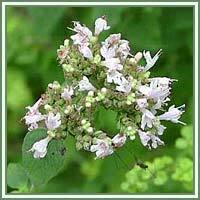 Do not use marjoram during pregnancy. Some herbs could react with certain medication. Therefore it is advisable to contact your doctor/herbalist before consumption of any herb.